Acer is pumping more horsepower into its Chromebook C910 with an optional Intel Core i5 processor based on the Broadwell architecture. The laptop, which has a 15.6-inch screen, has been available with Core i3 or Celeron processors. The Core i5 processor will add more application and graphics performance to the laptop. Intel's Core chips based on Broadwell are also used in Google's high-end Chromebook Pixel, which was announced last week starting at $999 with a Core i5 processor. 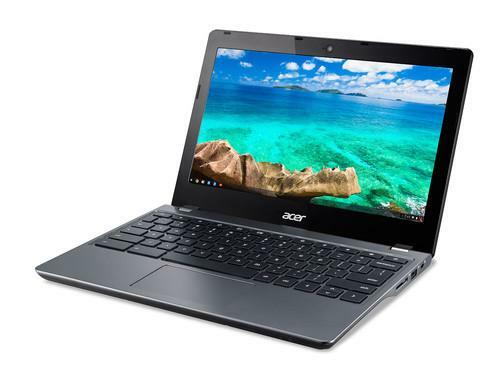 But the Acer Chromebooks are reasonably priced by comparison, and the C910 with Core i5 is priced at $499.99. Chromebooks are targeted at those who do most of their computing on the Web; an Internet connection is needed for most applications. Acer is calling the Chromebook C910 with Core i5 the fastest commercial Chromebook. Most Chromebooks are low-cost laptops running on Atom chips or Core or Celeron processors based on the Haswell microarchitecture, which is the predecessor to Broadwell. The C910 also stands out for its it big screen, which is the largest among Chromebooks. The Core i5 laptop weighs 2.2 kilograms and offers 4GB of RAM and 32GB of storage. The laptop comes with a full-high definition screen. Other features in the laptop include 802.11ac Wi-Fi, USB 3.0, USB 2.0, HDMI ports and an SD card reader. The laptop is available now, and specifications could vary based on country.